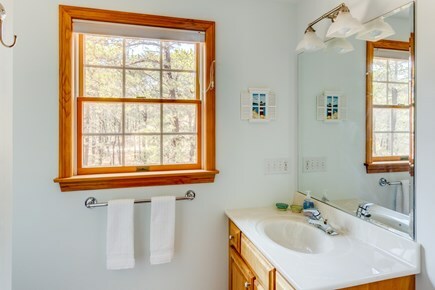 Three bedroom home walkable to Herring Pond! Living room perfect for a family. 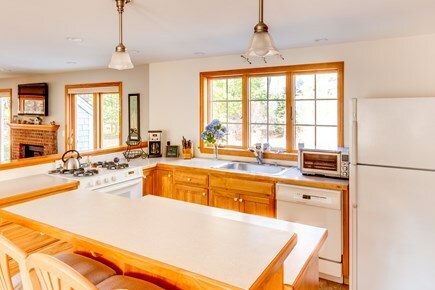 Fully stocked kitchen with ample room and great sunlight. 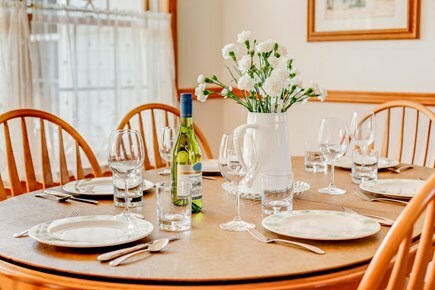 A wonderful home for family dinners. Master bedroom features a queen bed/en suite bath. Master bathroom with shower. All bathrooms equipped with towels. Sitting room off the living room. Queen bed in this upstairs bedroom with beautiful light. 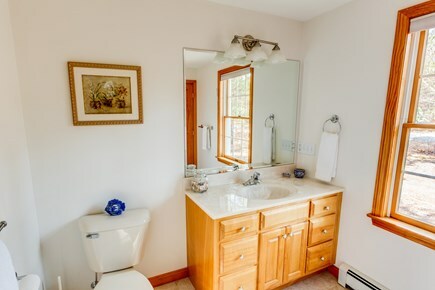 Upstairs bathroom with shower. All bathrooms equipped w/towels. 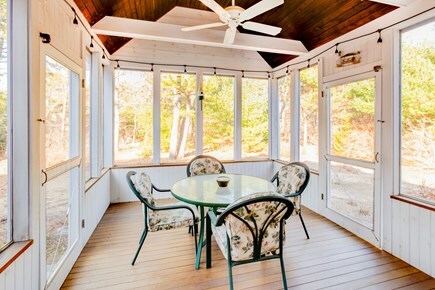 Fully screened in porch to enjoy outdoor meals. 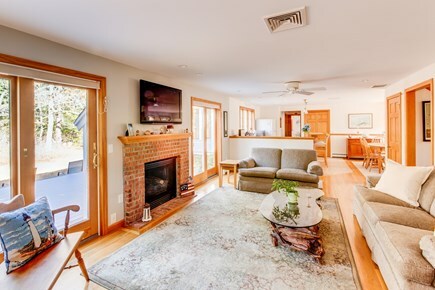 This spacious three bedroom home on a quiet road in Eastham is the perfect home base for your Cape Cod vacation. 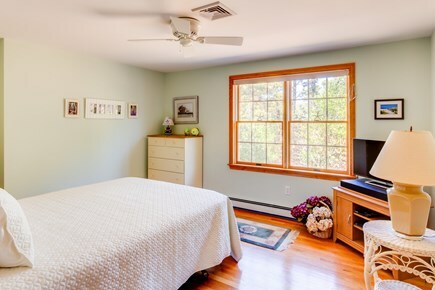 Central air conditioning and ceiling fans in all rooms. Hotel quality bed linens and bath towels are included with this home. 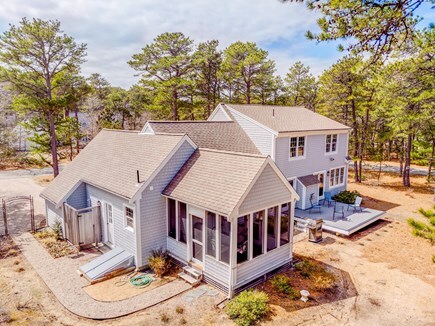 Walkable to a deeded beach on Herring Pond and minutes away from the ocean and bay beaches, this home provides convenient access to everything. 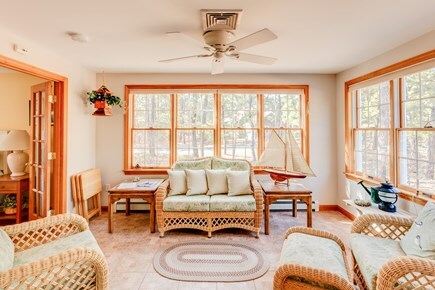 Relax in the living room with the windows open surrounded by the sounds of nature. 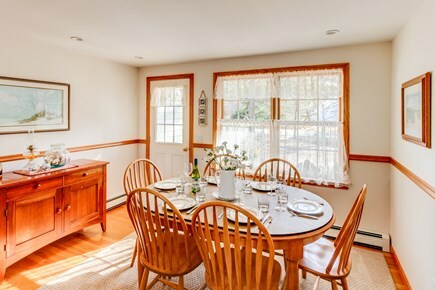 Prepare lunches and lobster dinners in the kitchen with an option to dine on the back deck or the screened in porch. 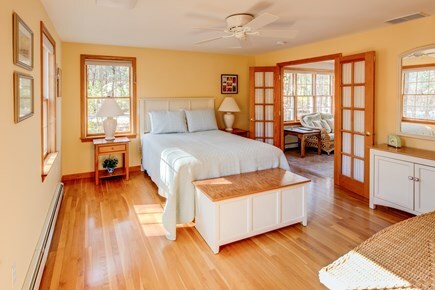 The three bedrooms provide a quiet and serene sleeping experience for all. The master features a queen bed, two twins in another and a queen bed in the third. 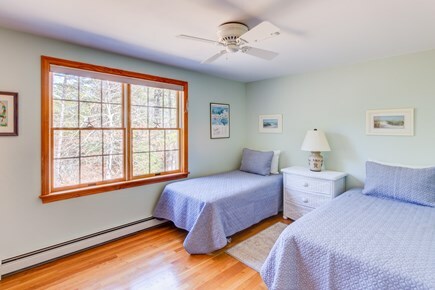 Access to a deeded beach at Herring Pond is only a five min walk away and perfect for families. World famous Coast Guard Beach is a 20 minute bike ride away through the Cape Cod National Seashore. If the Cape Cod Bay beaches are your speed, they are also a 15 minute bike ride away (or only 6 mins by car). 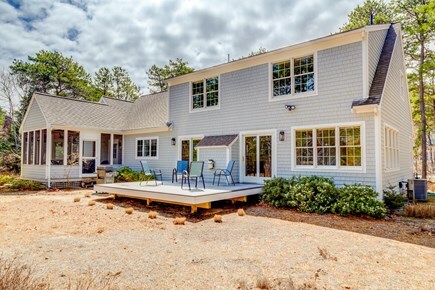 There are many options for dining in Eastham and Wellfleet that feature great local seafood. Arnold’s Lobster and Clam Bar (an Eastham summer institution) is literally 5 mins down the road (go early in your vacation because you just may want to come back again and again). 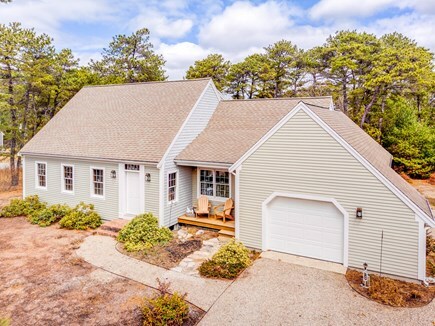 Bring your bikes or rent them in town (rental 5 mins away) and enjoy the Cape Cod Rail Trail: a 22 mile paved biking trail that stretches six Cape Cod towns from Dennis to Wellfleet - a Cape Cod treasure minutes away. Additional pricing info: Cleaning Fee $250, State and local taxes of 12.45% will apply.